Your guide to Perth locals’ favourite island getaway, Rottnest Island. Check the weather, leave on the first ferry, and hit the island at around 8:30am to enjoy eight hours of island paradise before the last ferry home. It will feel like a week away! And on Friday, the last return ferry from Rotto is at 7.10pm – so that’s 11 hours of pure escape. Better yet, kids travel free from Hillary’s for day trips on the school holidays. Take a day off work and enjoy three nights in premium two-bedroom units. Perfect for four mates, two couples or a family. Price includes ferries. Take a week or longer, settle back and enjoy the extraordinary tranquillity and beauty of the island, a million miles from the day-to-day. A five-night package in a premium two-bedroom unit starts at $690, including ferries for four people. This year is the 120th anniversary of the Wadjemup Lighthouse, built on March 17, 1896. There’s an exhibition commemorating its life at the Museum until May 26 – check it out. Female quokkas carry their young in their pouches during the winter. In winter, the Leeuwin Current brings warm waters down from the Kimberley, so the water temperatures at Rottnest are only 2-3 degrees cooler than in summer. The air temperature is mostly a few degrees warmer than Perth, with the average temperature of around 18-20 degrees, and plenty of glorious sunny days. On cooler days, sit back and watch the awesome rain clouds pass overhead on their way to the mainland. Ask any local and they will tell you this is the best time of the year for big swells. Not bringing your own gear? Surfboards, SUPS and wetsuits are available on the island through Pedal and Flipper. There are seven hot breaks you need time to enjoy without being hassled: Strickland Bay; Stark Bay; Chicken Reef; The Rotto Box; Ricey Beach; The Fruit Box; and Transits. Tropical fish and amazing corals brought down by the Leeuwin Current mix with 135 local species to make Rottnest a diving Mecca. 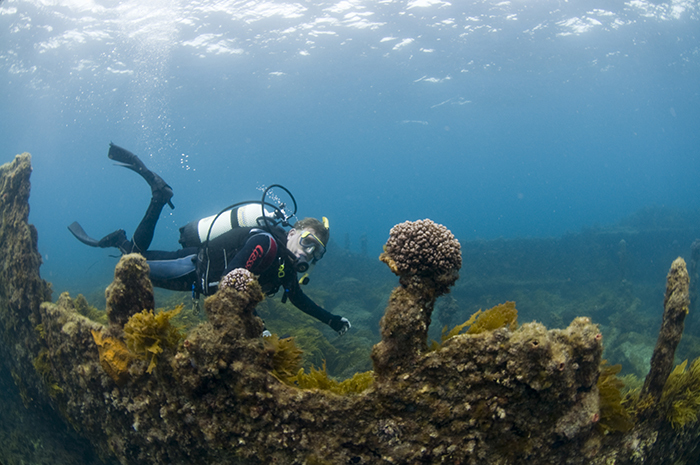 Crystal-clear water in winter means visibility can extend beyond 20m. Between shipwrecks, caves, walls and overhangs, there’s so much to enjoy underwater when the plankton has lessened, accentuating the vibrant colours. Rottnest Island Pedal and Flipper rents snorkel gear and wetsuits, and will fill scuba tanks, too! www.rottnestisland.com/pedalandflipper. fauna are astounding in winter, with vibrant reds of flourishing samphire complemented by the pinks of the salt lakes and rich greens of the tea trees. Trails range from 1km long at West End, through to 9.6km at Bickley, with the Lakes Walk a particularly stunning option at this time of year. Both the Australian sea lion and the New Zealand fur seal have found homes on the beaches and rocks at Rottnest, playfully cavorting among the waves. Whale-watching season for the migration of the majestic humpback begins at Rottnest in early September, and through to November they can be seen travelling along the coastline with their young. Rottnest Express and Rottnest Fast Ferries both offer amazing whale-watching tours. www.rottnestexpress.com.au; www.rottnestfastferries.com.au. If you’re partial to pink snapper, herring and King George whiting then you’ll love the shore fishing in winter, when large schools of tailor and salmon may also be seen. Rock lobster can also be caught until the end of the season on June 30. The General Store is a great spot to pick up what you need for bait and tackle – and remember to check the fisheries website if in doubt about your catch. The greens on the golf course are at their best in winter. Its nine holes are perfect for a day trip, with enough time left for lunch and a few quiet ones. The Club also offers lawn bowls and archery tag, which has become popular with families and group bookings. www.rottnestislandcountryclub.com.au. The female quokkas are carrying their young in their pouches during the winter. The little ones gestate for one month and then spend six months inside their mother’s pouch before they come out to play. During that time, baby quokkas are often seen poking their faces out of the pouch. Now skydiving has arrived at Rottnest – offered by Skydive Geronimo – it’s the perfect time to cross it off your bucket list. Rotorvation Helicopters and Rottnest Air Taxis offer spectacular scenic flights over the island, as well as an alternative to the ferry when it comes to being transferred to and from the mainland. Both services depart from Jandakot, while Rotorvation also leaves from Hillarys on weekends. www.skydivegeronimo.com.au; www.rotorvation.com.au; www.rottnest.de. Accommodation and ferry packages are fantastic in winter, and given that there is so much to do, it’s the perfect opportunity to unwind on a budget. www.rottnestisland.com. from a period as a penal settlement for Aboriginal men and boys, to time as a POW camp during WWI and II, and service as a military base to defend Fremantle Port and the West Australian coastline. The 9.2 inch Oliver Hill guns and tunnels, constructed to protect the coast during WWII, are now fully renovated, and you can ride, take the bus or catch the train there for a guided tour. www.rottnestisland.com/oliverhill. Rottnest is home to numerous varieties of local coastal birds, and in the winter you can spot crested terns, red-necked stints and flocks of banded stilts. According to the rangers, there are about 5000 birds, so don’t forget your Simpson & Day birdwatchers’ guide. Spotting and identifying birds is nerdy cool, and a fun thing to do with the kids. With fewer crowds and loads of adventurous options, enjoy one of Rottnest’s many tours. Take an off-road Segway Adventure, exploring the hidden treasures of the island, or if bus tours are your scene, try the Grand Island tour. Explore the stunning beauty of this A-Class reserve in comfort, taking in the amazing fauna and flora, stunning beaches, woodlands and salt lakes – all ending in an historic train ride. This 3.5 hour adventure also includes a lovely light lunch. For more info, head to www.rottnestisland.com. Wonderfully, there is hardly any sea breeze in winter. Nevertheless, before heading out, check the wind direction and pick a protected beach, with the wind blowing from behind. Rotto without a bike simply doesn’t make sense, and the beaches on the western side of the island are spectacular, so get in the saddle and explore them. Consider getting a bike with a trailer: they are perfect for tired kids and hauling your gear around the island. And, if your cycling skills are a bit rusty and you’re not even sure you will make it up that first hill, you can always hire an electric bike. Mini golf is goofy fun for pretty much anyone. The island also has a collection of pinball machines (or pinnies, as we used to call them when it was still 20 cents per game), plus video games undercover. You can also take a step back into the 50s in the old-style wooden movie theatre. Buy some popcorn, a soft drink and relax on your deckchair. It’s pure old-school fun. A dawn service, presided over by Australian Navy officers. The ceremony starts at 6am on the Thomson Bay foreshore, with early-morning ferry available. An exciting event held at Strickland Bay. www.surfingwa.com.au. Test your fitness, with the long course or sprint course. Golf Club’s premier events, dating back to the club’s conception in the 60s. www.rottnestgolf.org. Another premier event at Rottnest Island Golf Club. www.rottnestgolf.org. The island’s eighth annual comedy, film and music festival. www.rottofest.com.au. The end-of-season event for Rottnest Island Golf Club. www.rottnestgolf.org. This mini adventure race includes four challenging stages. Tackle the course individually or as a team of up to four people. www.racearoundrottnest.com.au. Compete in the full marathon or the 5km/10km fun runs. Heralded by the wail of bagpipes at 6am. www.wamc.org.au/major-events/rottnest-marathon-fun-run. The Carnivale is set to return bigger and better in 2016! Don’t miss out! www.rottnestisland.com/whats-on/event-calendar. Don’t miss WA’s most exciting paddling event, from Rottnest Island to Sorrento Beach, covering 27km. www.oceanpaddler.com. Conducted in the island’s crystal-clear protected waters, this event was first staged in 1977 and has been held annually ever since. www.swimthrurotto.com. The biggest kite-surfing event of the year is back in 2016. The seventh edition hits the water this month, with the reserve dates of December 4, 10 and 11 (due to weather). With prime waterfront positioning, Aristos is located right next to the jetty and playground, and is popular for sit-down meals and takeaway pizzas while watching the kids. One of the most popular Domes in WA, trusted for its adults’ and kids’ menus and its coffee. In the summer, it can be hard to get a table, but in winter, it’s a popular meeting place. Located close to the jetty, it is a great option for a last coffee before the ferry home. Gone are the days when all food had to be lugged over from the mainland. The two general stores have an excellent selection of groceries and fresh produce, and prices are more competitive than they used to be. If you order online before you go, your food will be waiting for you when you arrive – the fridge will even be stacked for you. The cafe serves great coffee, and some of the best food on the island. This is a favourite spot for anyone staying at Geordie, Longreach or Fay’s Bay, and is open from Thursday to Sundays during winter, except for the period between July 19 and September 8. Not just a sports bar, this little hub has live music every Saturday night, DJs on Thursdays and during autumn, and runs trivia nights on Tuesdays. This quintessential Australian pub is ideal for families and adults, rain or shine. With arguably the best outlook of any pub in WA, it’s usually the first port of call after you get off the ferry, and the site of many a long lunch during your stay. Provides quality coffee in the mall, with breakfast and lunch on offer. Love the freshly squeezed juices and homemade muffins! Try the huevos rancheros – you will come back for more. If you’re looking for gluten-free meals, this is your stop. Try the beautiful gourmet food and fresh juices, too. Relax around the pool or atrium for a delicious cocktail before indulging in the stunning new autumn/winter menu. breads (using specially developed Rottnest yeast), pork & fennel sausage rolls, and the famous Rotto pies all have to be sampled. The coffee is also really good. Simmo’s ice-cream is sublime, with up to 100 different flavours, made using the freshest local produce. Rottnest Subway claims to have the widest menu selection of any Subway in Australia! Outside of their subs and wraps, you can also try the FitChips and pizzas. Camping is a cheap option (at $36 per site per night, for up to six people) and the preferred choice for those who like to get close to nature. Sites are often booked out during summer, but there is plenty of room in cooler times. Looking for a romantic getaway? Then you have to indulge in the new Island Couples Retreat rooms. These two private and charming beachfront villas are located on the front row of Longreach Bay. They’re so close to the ocean, you could toss a pebble into the tranquil waters from your balcony. Both are self-contained, featuring a queen-size bed and a host of extras, including a large daybed in the courtyard, Nespresso machine, wine cooler and bar fridge, Bose audio system, a 32” TV, heater, ceiling fans, cutlery, crockery and gas barbecue. They’re great for honeymooners, but I’d recommend them as a great escape from the kids, too! Many of the beachfront villas have been upgraded and feature gas heaters, new couches and outdoor furniture, and renovated bathrooms. Those who have been holidaying on Rottnest for years will also be pleased to know that the linen is getting a makeover. Doonas have been added to all the villas, and will be in the rest of the accommodation by October, so no more scratchy blankets! Everyone has their favourite sites where they tend to congregate each year with friends, and although all the units have gorgeous vistas, there is nothing like front-row at Longreach and Geordie to make you feel like you are living the island life. North Heritage Bungalows. These all offer larger group accommodation at inexpensive rates, and are great for education groups, and those who don’t mind it ‘no frills’. The lodge features the Karma day spa, and there are fantastic deals over winter so you can come over for a quiet weekend. Golf weekends, wine dinners and spa packages are also available. www.rottnestlodge.com.au. Relax and unwind in your heated beachside retreat overlooking Thomson Bay. Curl up on your private balcony with a glass of wine and watch the winter storms roll in. Keep toasty in the bistro, and tuck-in to heart-warming meals. Indulge in seasonal specials, themed dining nights and Sunday roasts with all the trimmings. 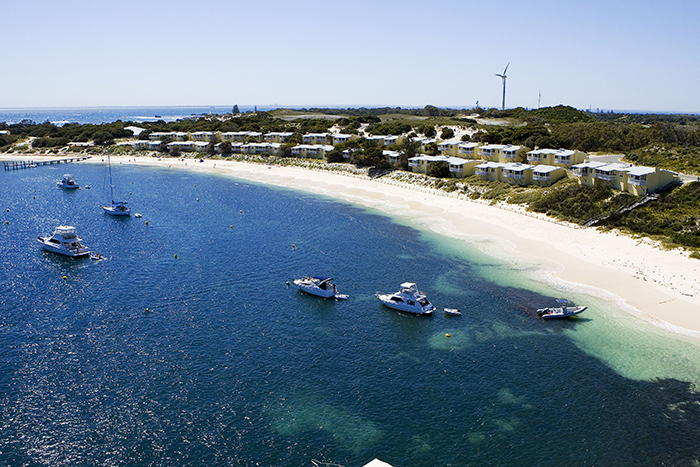 Hotel Rottnest is the ultimate winter getaway.